Technologies such as IoT, AI and 3D printing have a great deal to offer utility companies and manufacturers. With the world experiencing some of the most turbulent and volatile economic and political landscapes of the decade, it is reasonable to understand the uncertain climate industries are facing. Amidst all of this uncertainty however, has been the constant of the ever increasing rate of technology change. That technology will continue to evolve and disrupt industries, whilst also bringing about change to improve them and the people they serve – meet Industry 4.0. Two industries that are not only being affected by this digital revolution, but that also stand to benefit from it are the manufacturing and utilities sectors. Recent research has indeed found that utilities leaders rank the top benefits of technology as improving operational efficiency, boosting employee productivity and bringing new products and services to market more quickly. And in the case of manufacturers, 9-in-10 believe the sector will transform fundamentally by 2021 as a result of technology. So, what are the biggest technologies currently affecting and set to drive even further change to manufacturing and utilities? Let’s explore. Increasingly, artificial Intelligence (AI) and analytics will become just part of normal business operations. In light of this, the challenge for businesses is to attract the talent with the right skills for this new way of working, as 65% of manufacturers admit they are worried about their organisation’s ability to adapt to digital technologies like artificial intelligence. Large ‘traditional’ organisations will be competing with agile, ‘exciting’ new start-ups and the Google and Facebook’s of the world, meaning, businesses will need to position themselves as attractive employers if they are to find the right people with the skills to facilitate the new business model that incorporates AI and data analytics. Voice assistants were clearly the new kid on the block last year that made the big time, with Alexa, GoogleHome and Siri all growing in popularity amongst consumers. With new ways to talk to devices and products, we expect more manufacturers and service providers this year to use voice as an avenue to reach its customers directly, and provide feedback via more human systems of engagement. In a time where trust is hard to come by, blockchain will play an increasingly important role in building that trust, across an increasingly complex supply chain. It will enable an ecosystem of things to trade seamlessly and autonomously. This will include transactions of power and energy generation and distribution within smart grids, but also supply chain security in the logistics part of manufacturing especially where products are IoT enabled. For a number of years, we have heard that the number of connected devices will continue to increase; with the market size for IoT devices expected to reach 20.8 billion by 2020. As chip sizes continue to reduce, and low power networks such as SigFox and NB IoT become more available, both capital and operational costs will continue to fall, meaning the cost of IoT solutions will reduce, and more products will be embedded with the solution as a result driving further scales of economy. This in turn will continue to drive new business models and the push to servitisation, where consumers pay per use or pay for availability. This will allow companies to digitally transform their business model to provide services that can enhance and add value to their product offerings, as well as establish a relationship with customers and engage with them directly. This will be a significant change in business models and the supply chains, and require a new set of skills and capabilities from organisations if they are to orchestrate these new avenues of business. 3D printing (or additive manufacturing) continues to be more important, especially when it comes to the sale of spare parts and after sales service of businesses. The key here is in the process by which customers print components and how manufacturers manage digital rights for parts. Both manufacturers and utility companies need to think about how they adjust their business models, similar to music and film streaming services, so that there is a continued service which enables the printing of spare parts for goods, appliances and fixtures should it be required. 3D printing can even drive the adoption and production of IoT connected devices, thanks to 3D printings ability to print the connected components at a lower cost and on a larger scale, making it significantly more available for manufacturers and utility companies alike. As IoT and blockchain becomes more prevalent in the manufacturing and supply chain business, it’s imperative that security is embedded on the devices and products within systems and technology rather than as just an add-on. More and more machines and devices are now being built with their own IP addresses, and so the need for tougher and more robust security measures has never been so essential. Although IoT does present a range of new possibilities for businesses, it also exposes added chances for hackers to attack, which could have severe repercussions as we have seen on numerous companies both financially and reputationally. For example, manufacturers of driverless cars could see immense damage caused such as overriding the safety controls due to insufficient security measures which could have catastrophic consequences. For technology to truly help utilities and manufacturing companies see success in their endeavours, security needs to be incorporated in an organisation’s core, and play a fundamental part of the processes and polices to protect the systems and data. A denial of service attack when a business is a service, is in fact a denial of a business to operate. 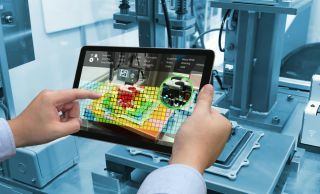 For utility companies and manufacturers that wish to capitalise on the new opportunities that technologies such as IoT, AI and 3D printing has to offer, they need to be savvy to the ways in which they can adapt and advance their business. By seeking the right initiatives and understanding how the six technologies can aid their business, they can create new business and revenue models that differentiate them from other market players and give them longevity in such a disruptive market. In the end, those that are agile and embrace it will reap the rewards in the years to come.